Nosebleeds are very common. In fact, 1 in 7 people living in the United States will have at least one nosebleed at some point during their life. Although it might seem scary while it’s happening, a nosebleed isn’t usually dangerous. 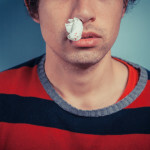 Read on for more information about why a nosebleed happens, how to treat it, and ways to prevent it. A nosebleed (also called “epistaxis”) is exactly what it sounds like – bleeding from the nose. The most common type of nosebleed is called an anterior nosebleed, which means that the blood is coming from the front of the nose. An anterior nosebleed occurs when tiny blood vessels inside your nose break and bleed. Another type of nosebleed is called a posterior nosebleed, which means that the blood is coming from the back of the nose. The blood from this type of nosebleed will go down a person’s throat instead of out of the nostrils. Posterior nosebleeds are much more common in adults or in someone who experiences an injury to the nose or face. It’s more likely that you would need to see a health care provider for this type of nosebleed. There are many things that may cause a nosebleed (such as an injury to your nose), but the most common causes are dry air, allergies, colds, sinusitis, some types of nose drops, and nose picking. When the air around you is dry (either from low humidity or heated indoor air) the membranes inside your nose can become very dry. This can cause an itchy crust to develop, and if you scratch or pick at it, it can cause bleeding. Your nasal membranes can also become irritated from allergies, colds, or sinusitis. Blowing your nose over and over again can cause bleeding as well. What do I do if my nose is bleeding? Get something to catch the blood, such as tissues, paper towel, or a damp cloth. Make sure to sit up (lying down can cause the blood to drip down the throat) and lean forward. Sitting up with your body tilted forward lowers the pressure in your nose and helps prevent you from swallowing blood, which can bother your stomach. Gently blow your nose to get rid of clots, and then pinch your nostrils shut with your thumb and index finger. Breathe through your mouth. Do this for 5 minutes (10-15 minutes for adults). If your nose is still bleeding after 5 minutes, keep holding this position for another 10 minutes. After your nosebleed has stopped, don’t do anything that would cause you to strain. Make sure that you don’t blow or pick your nose for about 24 hours. What happens if my nose doesn’t stop bleeding? Most nosebleeds will stop either on their own or by following the steps above. What if I get nosebleeds a lot? If you have frequent nosebleeds such as more than once a week, talk with your health care provider. He or she will ask you if other members of your family have a lot of nosebleeds or a bleeding problem and may want you to have a blood test to check for anemia and clotting problems. Treatment depends on the cause (injury, allergies, infections, clotting problems etc.). Is there anything I can do to prevent a nosebleed? If you have a cold or allergies, or whenever you need to blow your nose, make sure you do it gently. Avoid picking your nose, even if it itches. Wear the proper protective sports equipment when playing sports to avoid a nose injury. Use a humidifier in your room to help keep the air moist in the winter.